Google+ launched brand pages in November. Already many companies, groups and organizations have established large numbers of followers on the social network. To check Google+ brand page rankings, you can now use Zoomsphere, a statistics site for major social networks. Track followers, engagement rates, activities, +1’s, shares, and comments. Rank all pages, or just the pages of a category, such as local business. Here is a list of the top twenty most-circled brand pages on Google+ according to Zoomsphere. Numbers are taken from January 23, 2012. 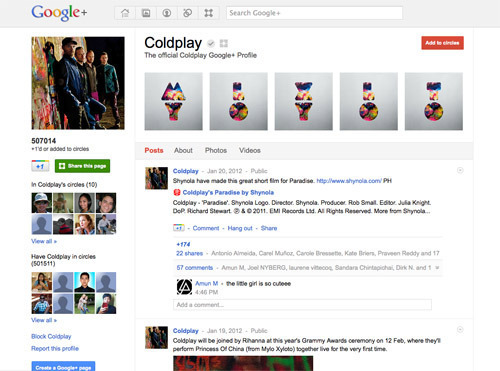 Coldplay is in 501,511 circles on Google+. 507,014 fans have +1’d or circled it. 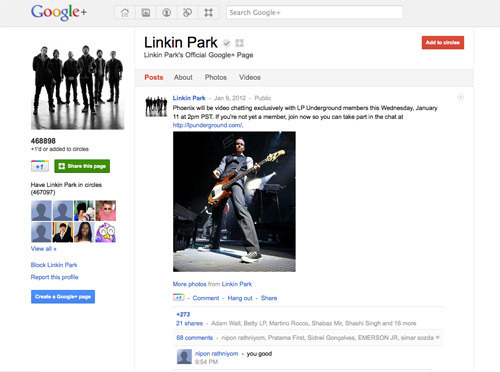 Linkin Park is in 467,097 circles on Google+. 468,898 fans have +1’d or circled it. 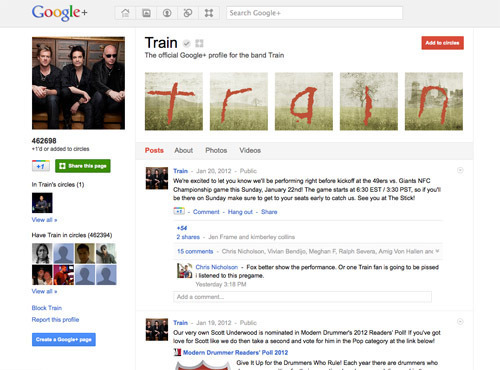 Train is in 462,394 circles on Google+. 462,698 fans have +1’d or circled it. 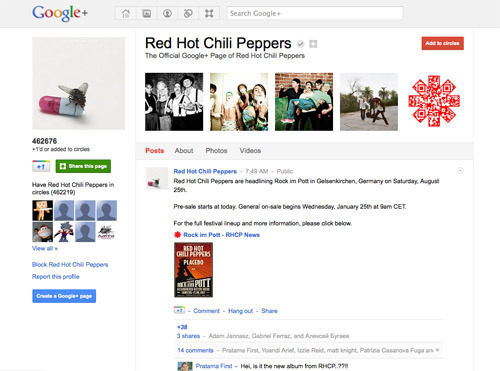 Red Hot Chili Peppers is in 462,219 circles on Google+. 462,676 fans have +1’d or circled it. 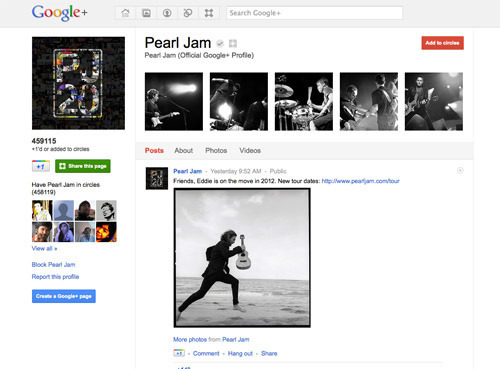 Pearl Jam is in 458,119 circles on Google+. 459,115 fans have +1’d or circled it. 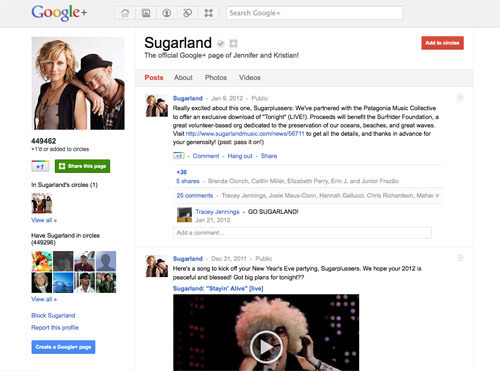 Sugarland is in 449,296 circles on Google+. 449,462 fans have +1’d or circled it. 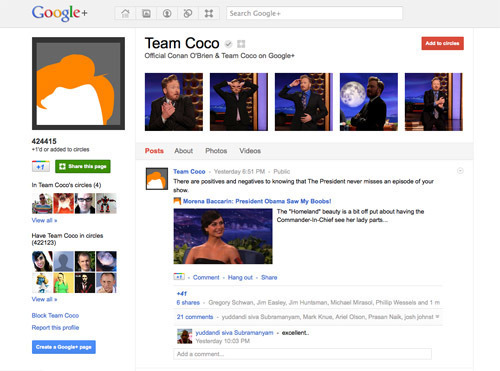 Team Coco is in 422,123 circles on Google+. 424,415 fans have +1’d or circled it. 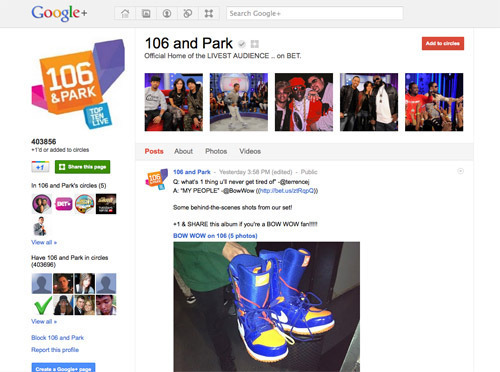 106 and Park is in 403,696 circles on Google+. 403,856 fans have +1’d or circled it. Android is in 359,602 circles on Google+. 388,409 fans have +1’d or circled it. 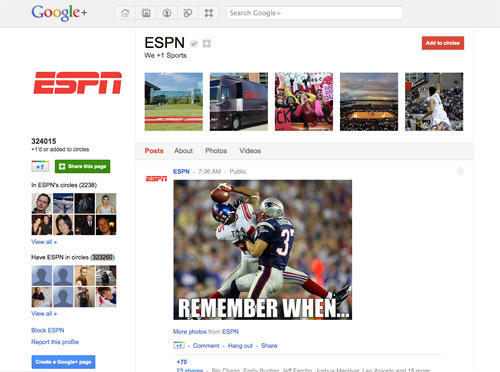 ESPN is in 323,260 circles on Google+. 324,015 fans have +1’d or circled it. 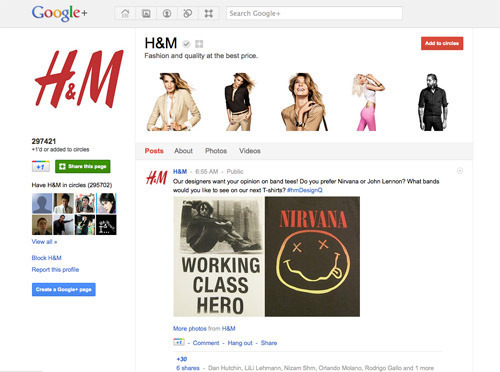 H&M is in 295,702 circles on Google+. 297,421 fans have +1’d or circled it. 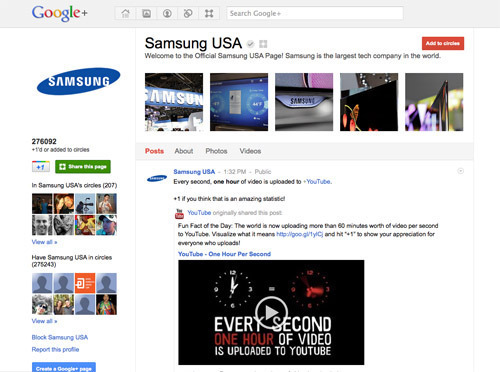 Samsung USA is in 275,243 circles on Google+. 276,092 fans have +1’d or circled it. 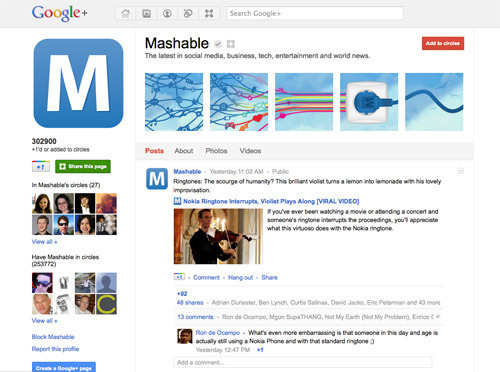 Mashable is in 253,772 circles on Google+. 302,900 fans have +1’d or circled it. 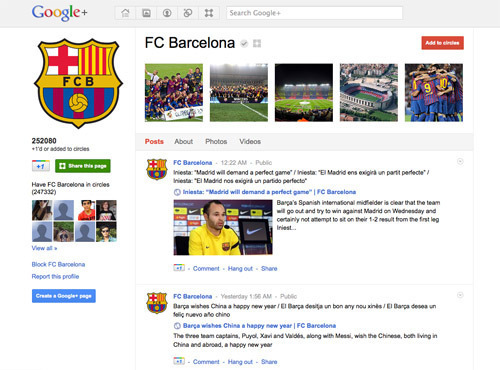 FC Barcelona is in 247,332 circles on Google+. 252,080 fans have +1’d or circled it. 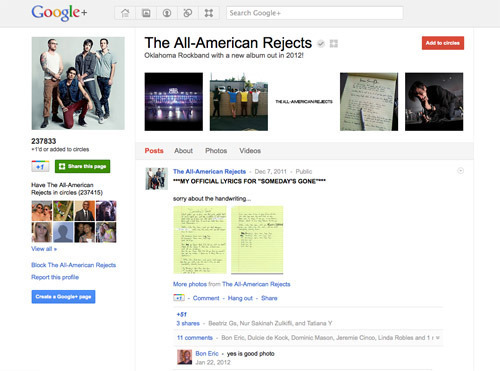 The All-American Rejects is in 237,415 circles on Google+. 237,833 fans have +1’d or circled it. 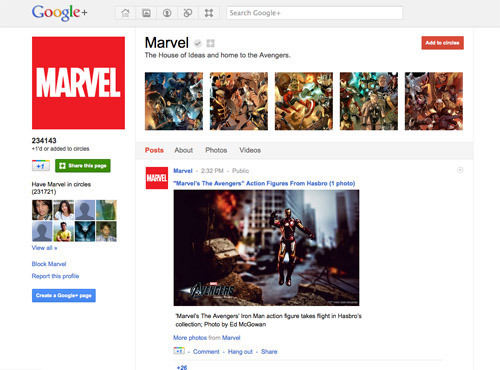 Marvel is in 231,721 circles on Google+. 234,143 fans have +1’d or circled it. 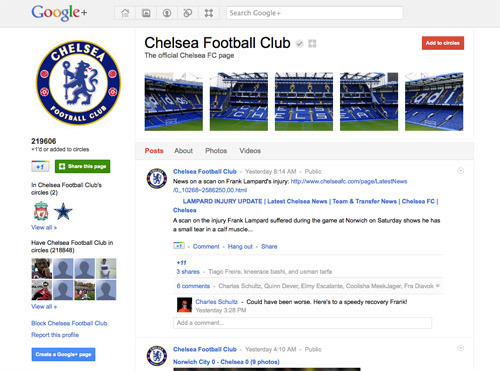 Chelsea Football Club is in 218,848 circles on Google+. 219,606 fans have +1’d or circled it. 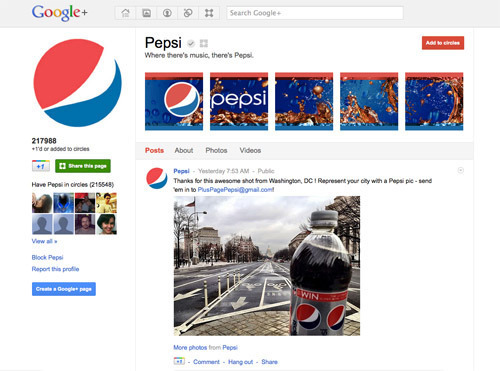 Pepsi is in 215,548 circles on Google+. 217,988 fans have +1’d or circled it. 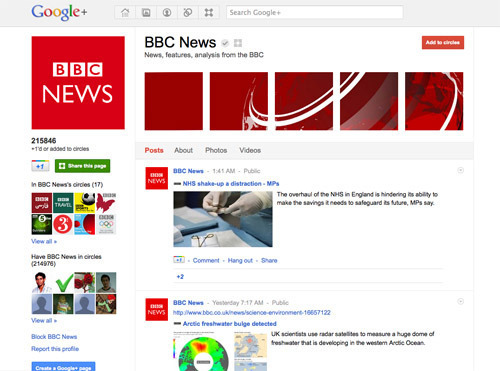 BBC News is in 214,976 circles on Google+. 215,846 fans have +1’d or circled it. 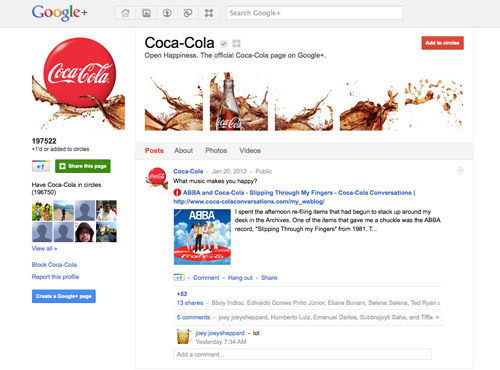 Coca-Cola is in 196,750 circles on Google+. 197,522 fans have +1’d or circled it. 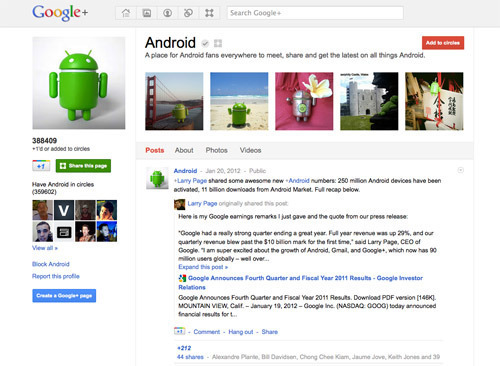 Google+: The Beginning of a Revolution?